RSVP! Be sure to RSVP to your host in the manner they’ve requested (in writing, via phone call, etc.) Once you accept an invitation, hold the commitment and make sure to be on time. If a schedule conflict looks unavoidable, let your host know as early as possible to allow for proper planning and adjustments. Dress for the occasion – Check with your host or hostess for the dress code if it hasn’t been specified in the invitation. Formal, casual, or theme parties may require extra shopping and preparation on your part. Be prepared for both warm and cool indoor temperatures – If your jacket is the show piece of your outfit, be sure you can take it off and still look appropriate in the layer that’s underneath the jacket. Prepare for a chilly room or the outdoors by bringing a festive shawl or a nice-looking cardigan. Don’t be a Pepe Le Pew! When preparing for an intimate gathering, go light on perfume, or even better, avoid the perfume altogether. Many people are allergic to scents or turned off by heavy colognes and perfumes. Be prepared for parties in a house that has a “no-shoes” rule. Make sure you feel confident with your pedicure, and that you’re comfortable in your outfit without shoes. Always be sure to wear clean socks or hose with no holes in them. If you have food allergies, don’t make it a problem for the already overworked host or hostess. 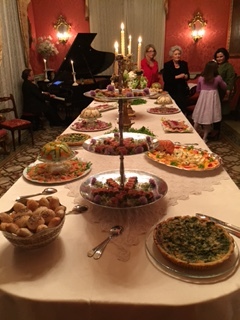 Eat before the party, or offer to bring a dish to share. If you have pet allergies, bring your allergy medicine with you. Look for a chair that’s wooden or leather and avoid sitting on the upholstered chair. Keep your mobile phone use to a minimum, and ask people nearby before you take a group photo. If you need to check in with the babysitter, step outside to make the call. Watch the host or hostess for signs of fatigue. If either of them starts yawning, gets up to clean, or stops pouring wine, take the hint and wrap up the evening by giving your thanks and offering one last time to help with cleaning up. 10. Send a note within 24 hours to thank your host or hostess for the special event. Now go out, have fun, and be merry this Holiday Season!